Huawei FusionServers and DataCore Software-Defined Storage combine to deliver the predictable performance, continuous availability and “plug and play” simplicity that organizations demand today. Ideal hyper-converged solutions for Microsoft and mixed Hyper-V and VMware virtualization projects; DataCore works with any hypervisor and any storage media—Disk, Flash, Cloud Storage. High–availability and metro-clustering for business continuity and disaster recovery. Extreme performance acceleration for mission-critical business applications—SQL, Oracle, ERP, SAP. DataCore in combination with Huawei can now provide 100% Huawei hardware solutions, end to end, covering storage, network, and compute needs in order to provide complete datacenter solutions delivering state-of-the-art enterprise storage capabilities. These solutions provide enterprise-class storage features for both self-contained hyper-converged solutions as well as architectures that allow independent scaling of storage and compute, all connected by a Huawei-powered network fabric. Optionally, new Huawei OceanStor storage systems or existing legacy external storage arrays from third parties can also be easily integrated and managed as part of these combined solutions when needed to meet current or future business requirements. Easily set up fully-redundant clusters with just two servers and inexpensive internal storage for ROBO sites, VDI deployments and application clusters. Other alternatives require you to use a minimum of 3 or more servers, driving up costs by 33% and adding complexity. In addition, just 2 servers are needed for a stretch cluster versus other options that require many more servers. The 33% savings becomes especially significant when calculated across numerous sites and clusters. Synchronous mirroring with zero-touch failover and failback between any type of storage ensures that applications are not disrupted by storage or site outages. Seamlessly migrate data between unlike systems, during production, without impacting applications. High-performance caching algorithms intelligently anticipate reads, evaluate usage patterns and transform random writes into sequential writes. In addition, auto-tiering capabilities dynamically match data to the most appropriate class of storage from the virtual pool. Eliminates wasted storage capacity by pooling all of your storage, regardless of make/manufacturer. Centralized management using a common set of commands across disparate systems, together with extensive automation reduces administrative time. 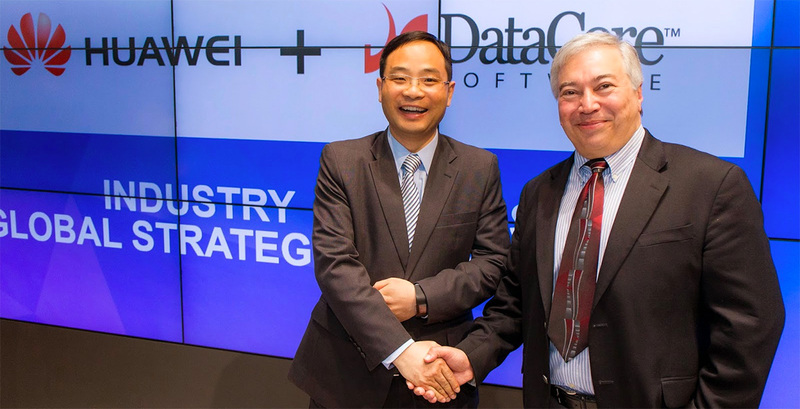 Mr. Zheng Yelai, President of Huawei’s IT product line, and George Teixeira, Chairman and Co-founder, DataCore, launch global partnership. “We are pleased to launch our new Hyper-Converged and Software-defined Storage Solutions with DataCore and to take the concept of convergence to the next level. In this digital age, businesses can grow very quickly and they need datacenter infrastructure that delivers scalability and improves resilience. With DataCore’s expertise in the Software-defined storage area and Huawei’s experience in providing cutting-edge ICT infrastructure such as high performance servers, storage and SSD cards, our Hyper-Converged Solutions help businesses build a seamless architecture to compete in a fast-changing environment,” said Mr. Zheng Yelai, President of Huawei’s IT product line. Huawei is a global leader of ICT solutions. Continuously innovating based on customer needs, Huawei is committed to enhancing customer experiences and creating maximum value for telecom carriers, enterprises, and consumers. Huawei’s telecom network equipment, IT products and solutions, and smart devices are used in 170 countries and regions. With annual sales revenue of USD39.6 billion in 2013, Huawei ranked 285th on the Global Fortune 500.